1. Many Wigan fans may have travelled over the Pennines with hope rather than expectations. And when they arrived and discovered Zak Hardaker had withdrawn for family reasons - taking the number of absent frontline players to nine - they probably got what they expected: another narrow loss, Wigan's seventh in 10 games, which leaves them just two points above bottom-club Leeds heading into the packed Easter schedule. 2. Wigan did well to survive an early onslaught and lead 4-0 at the 36th minute mark. But, incredibly, Wakefield scored three tries before half-time - and added another just from the restart - to rack up four tries in six minutes of play and take a 22-4 lead. Let's repeat that - four. Tries. In. Six. Minutes. It was an astonishing lapse of concentration from the Warriors, littered with some soft defending; it looked as if they were playing touch rugby as David Fifita stormed down their right edge to set-up a try. That small window proved hugely significant because either side of that six minute spell - both before and after - Wigan scored the more points, but the damage had been done. Joe Shorrocks became the third academy-graduate to earn a debut this year, coming off the bench for an industrious spell. And another teenager, Morgan Smithies, was one of Wigan's best players - all energy and aggression. 4. 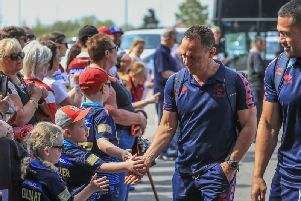 Trinity coach Chris Chester accused Wigan of "naughty" tactics during the game. He said there were were a few "challenges where players attacked the knees". "As soon as that is eradicated the better because it was ridiculous," he said. "I thought it could have been dealt with better." Lam, his former Wigan team-mate, said he didn't notice any illegal play and thought the challenge which led to Sam Powell being placed on report was fine. The match review panel will scrutinise the game on Monday... Lam could do without any suspension worries ahead of the Good Friday derby. 5. Chester was disappointed because he had lost four players to injury during the match - the last just after the hour-mark. And Wakefield deserve plenty of praise for doing it tough without any substitutions by the end, forcing Fifita to motor through 80 minutes - a huge effort from the big man. "It was an unbelievable effort," said Chester. "I tried bringing him off after 60 minutes and he gave me the death stare, so I thought I'd bring someone else off!" Fifita is out-of-contract later this year but Chester says he is confident he will sign a new contract within days.